Amazon started widely selling its Echo speaker, voiced by the personal assistant Alexa, in 2015. Since then, the name has declined in popularity 33%. Are people afraid that their Echo will answer when they call out their kid’s name? Or are they just tired of hearing it all the time?Siri has never been a very popular name. Amazon started widely selling its Echo speaker, voiced by the Star Trek-inspired personal assistant Alexa, in 2015. 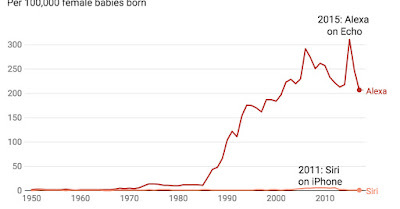 That year, 6,050 baby girls in the United States were named Alexa, or 311 for every 100,000 female babies born. Since then, the name has declined in popularity 33 percent, according to new data from the Social Security Administration crunched by University of Maryland sociology professor Philip Cohen. Last year, just 3,883 baby girls were named Alexa. Siri, Apple’s virtual assistant that launched on iPhones in 2011, has never been a very popular name. That name peaked in popularity two years earlier, when 120 female babies in the U.S. were named Siri, about 6 per every 100,000 girls. 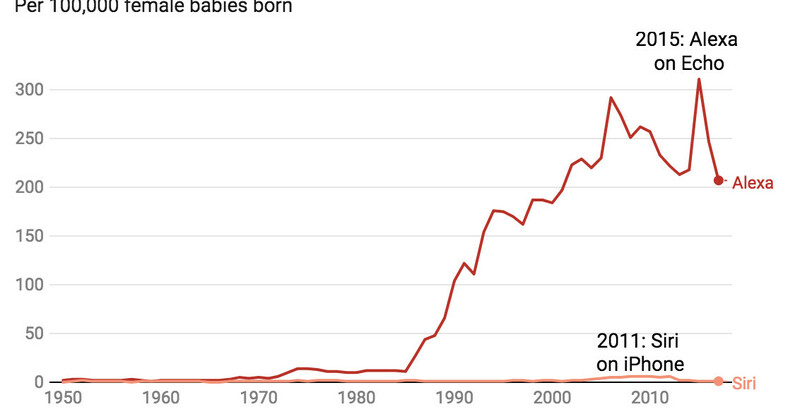 Last year, 20 U.S. girls were named ‘Siri,’ or about 1 per every 100,000. Are people afraid that their Echo will answer when they call out their kid’s name? Or are they just tired of hearing it all the time? Maybe people just don’t want to call their virtual assistant and their child by the same name.